In line with our commitment to be your most reliable source for all things related to skin care, we’ve come up with this roundup for the best exfoliator for oily skin. We spent more than 16 hours of hard work and intense research to rank the top performing products in the market today based on their compatibility with oily skin and combat the chances of skin breakouts. If you are looking for a natural face scrub for your oily skin, then St. Ives Apricot Scrub Blemish Control is the one for you. Instead of the artificial microbeads you can find in most exfoliators, this one has apricot extracts and walnut shell powder to deeply but gently cleanse your pores. Jack Black Face Buff Energizing Scrub has very minute exfoliating beads to open up your pores and prevent ingrown hair in between shavings. It has menthol and vitamin C to give your skin a refreshing feel each time you use it. Repechage One Minute Exfoliating Mask has natural exfoliating beads to get rid of your skin's excess oil and dead cells. It's a good choice if you want to pamper your skin with a good exfoliating mask that won't take much time. Containing benzoyl peroxide, Proactiv+ Skin Smoothing Exfoliator can help reduce those large pores you've been struggling so hard to conceal. On top of this benefit, it can also prevent your skin from breaking out. Freeman Feeling Beautiful Charcoal & Black Sugar Gel Mask and Scrub has great ingredients that can pull dirt off of your pores and control oil. It won't leave your skin dry but can cause stinging sensation if you have very sensitive skin. 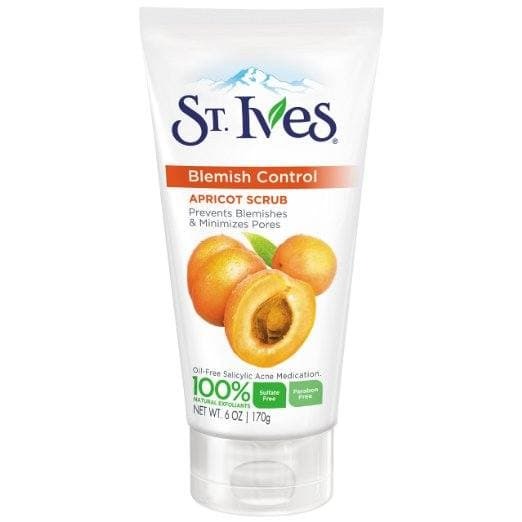 St. Ives Apricot Scrub Blemish Control is highly raved about by a lot of people and if you have oily skin (which I suppose you do), you may want to give this product a try. It has an oil-free formulation that can gently exfoliate your skin and unclog your pores. The good thing about this exfoliator is that it isn’t as drying to the skin as other products are. It has 100% exfoliants, like apricot extracts and walnut shell powder. Now, don’t let these products intimidate you. Although they might not sound like the most gentle ingredients you can exfoliate your skin with, St. Ives actually has a hypoallergenic and non-comedogenic formulation. Despite this, I’m stressing out that you still need to be gentle with your skin. Although it’s hypoallergenic, it doesn’t mean you can scrub the exfoliators hard on your skin. As for the benefits you can get from this affordable product, it can minimize your pores, control oil and prevent breakouts with its salicylic acid content. Jack Black Face Buff Energizing Scrub is originally formulated as a pre-shave scrub which you have to use 3 to 4 times a week to get rid of the nasty ingrown hair that comes with hair removal. It also makes a good exfoliator for oily skin since it can unclog pores and exfoliate the skin without leaving it excessively dry. What makes this product even nicer is that it’s vegan and dermatologist tested. Two potent ingredients you can find in it is vitamin C and menthol. Vitamin C has antibacterial and anti-inflammatory properties to protect your pores from factors that can make it over productive. Menthol, on the other hand, can reduce your skin’s secretion of oil. Despite being beneficial to oily skin, these two ingredients aren’t compatible with sensitive skin as they can cause irritation. You may also find its musty scent not too great. Repechage One Minute Exfoliating Mask is a bit different from the other products on this list. It’s actually a mask which you have to apply on your skin for one minute to exfoliate dead skin cells. The exfoliator has 100% natural exfoliating beads. It’s gentle enough to not cause microscopic tears on your skin. The product has licorice root extracts, mulberry as well as kojic acid. The combination of these ingredients makes it greatly effective in polishing away dead skin cells and skin impurities. The exfoliator even does a great job in getting rid of clogged pores. It can also absorb oil without excessively drying out your skin. Another great thing about this product is that it also has vitamins E and D. This means you won’t only get exfoliation but skin nourishment, too. Proactiv+ Skin Smoothing Exfoliator is the first step in Proactiv’s 3+ step system. It’s designed to gently exfoliate the skin, make it clearer and reduce skin breakouts. One of the benefits you’ll love in this product is that it can minimize the appearance of pores. For oily skin, large pores can be quite inevitable and this is exactly how this exfoliator can help you. I’d have to warn you though, this product is definitely not for everyone. It has grainy beads which some people actually consider too harsh for the skin. If you have an oily skin that’s also sensitive, you might want to skip this product and look for alternatives. Skin Smoothing Exfoliator has a cleansing agent containing benzoyl peroxide on top of the scrubs. It lathers well and can leave your skin polished. Freeman Feeling Beautiful Charcoal & Black Sugar Gel Mask and Scrub is another multipurpose product in this list. If you’re like me who likes to multitask, grabbing this exfoliator can surely make your skin care routine a lot easier- and faster. The product can detox and exfoliate the skin with its activated charcoal and black sugar. It helps absorb oil while keeping your skin soft and clear. To use the product, you’ll need to apply in on your face and neck and leave it on for 5 to 7 minutes before rinsing off with warm water. You’re supposed to do this once or twice a week to get the most out of the product. It’s a bit gritty and clumpy which can make it a bit difficult to use as a mask. However, since you’re only going to use it a couple of times per week, I’d say you can just consider it a time invested for your skin. When you are dealing with oily skin, the last skin care routine you’d want to miss is exfoliation. Skin normally has a way to get rid of dead skin cells on its own. However, with oily skin, shedding off unwanted cells become sluggish to the point that they accumulate. As a result, you can develop clogged pores, skin breakouts and dull looking skin. And these are the exact same things that can stop you from getting the skin you want. As a general rule, the oilier your skin is, the more frequent you should exfoliate. Start off with once a week and progress to biweekly or an every other day exfoliation. Instead of hot or cold water, stick with using lukewarm water when rinsing your face. This will make it easier for your scrub to breakdown the glue that holds dead skin cells together. Use gentle circular motion when exfoliating. Although you’re trying to get rid of your skin impurities, you wouldn’t want to overdo it. When you over exfoliate, it renders your skin excessively dry. This will trick your skin to think that there’s not enough oil to protect itself. As a result, it will try to “compensate” by secreting more oil on your already oily skin. Yikes! To know if you are over exfoliating, one good trick is to assess your skin after. If you feel that it’s too tight or dry, then yes, you’re doing it too much. Reduce the number of times you exfoliate and allow your skin to regain its natural process. Exfoliating oily skin is really tricky, especially if you aren’t really sure what you’re looking for in a product. For oily skin, there are two things you need to achieve when exfoliating. One is to get rid of your dead skin cells and to balance out your skin’s oil production. Choosing an exfoliator with salicylic acid can help you achieve these things. It can provide deep cleansing, especially when it comes to your clogged pores and hardened skin cells. When it comes to scrubs, make sure that your exfoliator doesn’t have too abrasive particles. Although your goal is to shed dead skin cells, you’d still want to keep your skin as safe and healthy as possible.